Whether you are just beginning to learn how to fish for carp or you have been carp fishing for your entire life, it is crucial that you have a solid understanding of the right type of tackle to use in order to land this fish. Due to both the size and tenacity of these fish, carp fishing requires more rugged tackle than is used for most other freshwater fish. There is also specialized carp fishing tackle that is designed to exploit the feeding habits of carp that can take your carp fishing skills to the next level if they are used correctly. 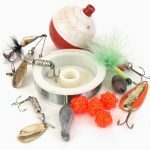 Here is what you need to know about the different types of carp fishing tackle. The most important type of carp fishing tackle is also the most common, including hooks, leaders and fishing line. When it comes to fishing for carp, you need to make sure that you have high quality fishing hooks that are guaranteed to get the job done. The ideal hooks for carp fishing have long shanks that allow the hook to be set firmly in the carp’s mouth and feature an in-turned point with microbarbs that will protect your rig from getting snared on weeds and other items on the bottom of a river or lake. Fishermen are advised not to use pre-tied hooks, as larger carp may snap these lines before you even begin to reel the fish in. Instead, consider using leaders with lead clips and swivels that will make it easy to change your rig and are nearly impossible for for a carp to break. Be sure to use fishing line that is graded to bring in a carp in excess of 25 lbs. The fishing line does not need to be clear or lightly colored, as a carp’s eye sight is too poor to see most types of fishing line. Even if you have high quality fishing line on your reel, remember to change your line from time to time, as fishing line will deteriorate over a season once it has been exposed to the elements. One very useful form of tackle that is used almost exclusively for carp fishing is a marker float. Marker floats are large, heavy-duty floats that are used by fishermen to determine the features and conditions of the bottom of a body of water. The device is shaped very similarly to a dart with a swivel on the bottom. A marker float is used by attaching it to the mainline along with a bead and a weight. Once this simple rig has been set up, a fisherman will launch the marker float to the area he interested in and make observations on the marker float as he reels the rig back in. If it is difficult to reel in the rig in a particular area, the fisherman will know that the spot below the marker float consists of weeds, mud or other materials. After getting a rough idea of the differing bottom conditions in the surrounding area, a fisherman will use his knowledge to the feeding habits of carp to focus on the locations that the most likely to contain monster carp.